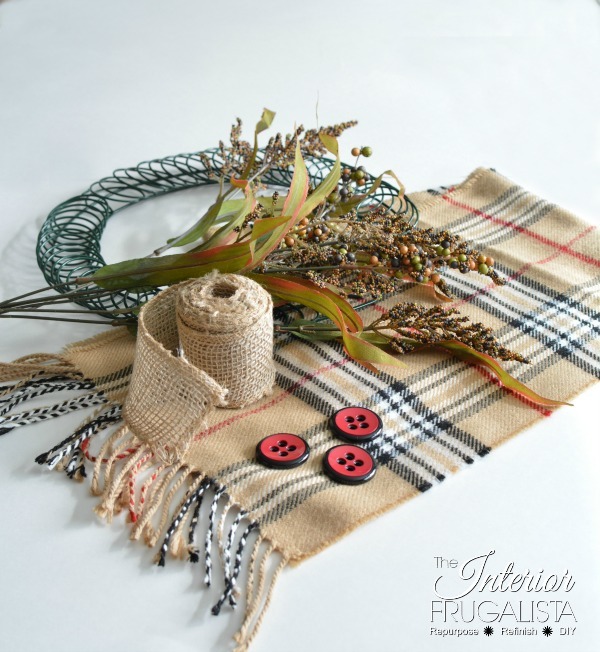 Today I'm sharing A Quick And Easy DIY Fall Scarf Wreath using an inexpensive knock off plaid Burberry scarf, buttons, and burlap. My goal for making this wreath was that it had to be made with things found around the house. That wasn't a difficult task considering I keep everything! 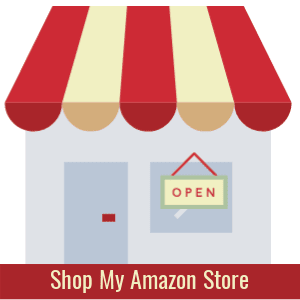 Alternatively, everything could be purchased inexpensively at a thrift store and/or dollar store. 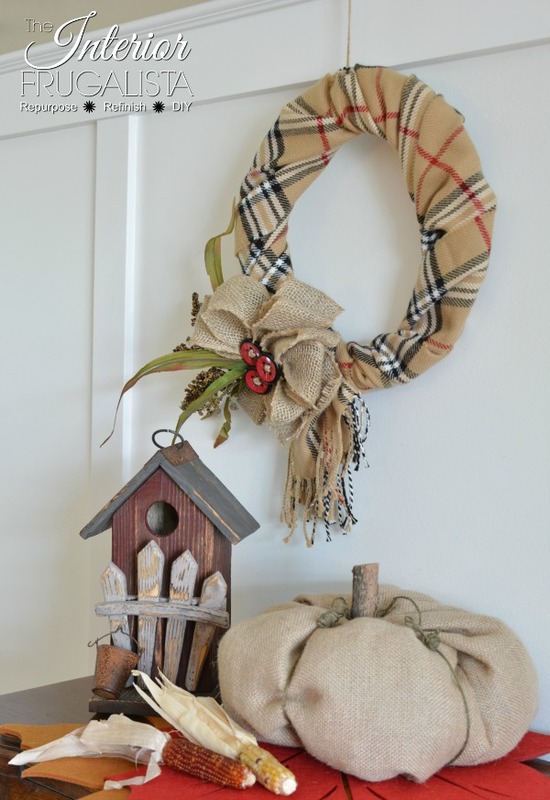 If you are looking for Fall decorating inspiration, then it's your lucky week! 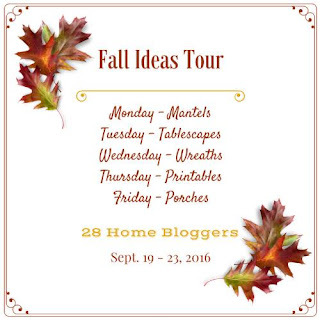 I am so excited to be part of the Fall Inspiration Tour 2016. Each day throughout the week several talented bloggers have come together to bring you loads of Fall decorating ideas and today's leg of the tour is about Fall Wreaths. 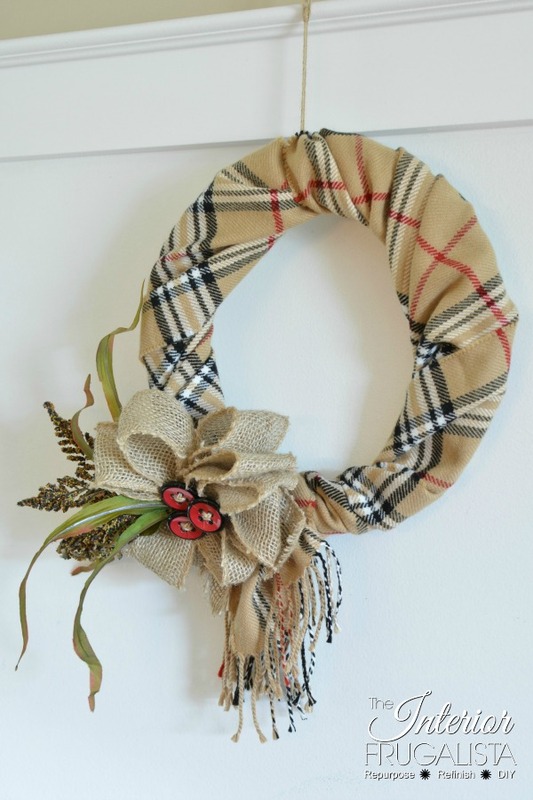 As mentioned above, I did NOT use an expensive Burberry Scarf on my wreath but rather an inexpensive knock off. 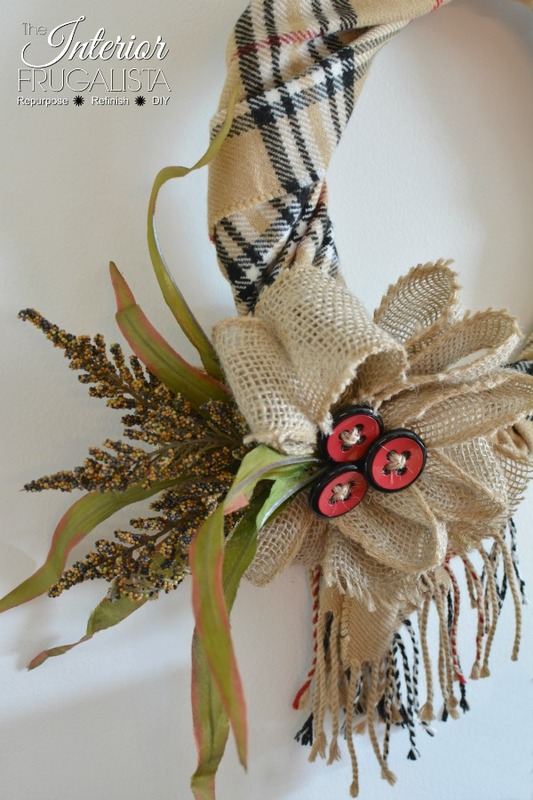 It's a Fall Wreath with some class without spending a whole lotta cash! That's pretty much it in a nutshell! 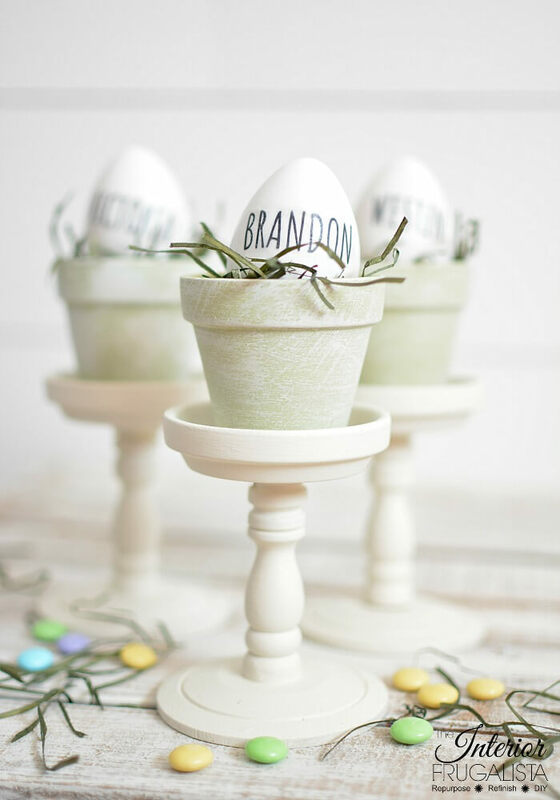 You could use a foam or wood wreath form as well. You want something with dimension so the scarf doesn't look flat. 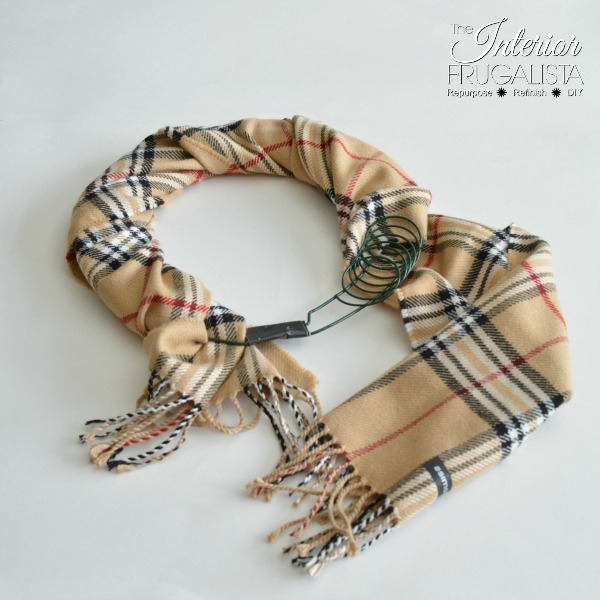 Simply tie a bow to join both ends of the scarf. Last year right after the holidays I hit the jackpot at Goodwill when they were clearing out the Christmas wreaths, you know those ones with the dusty old felt Santas and Snowmen. I just wanted the 50¢ wreath forms so the first thing I did when I got home was wallop off the Santa and Snowman. Hence the reason for the duct tape joining both ends on the bottom (pictured above). Make a 6-loop bow with 2-inch burlap ribbon. Sorry, I didn't take pictures of this step but I have included a helpful video tutorial found on YouTube. Behind the bow, place three Fall Floral Stems and hot glue them in place to the back of the bow, cutting off the excess stem with wire cutters. 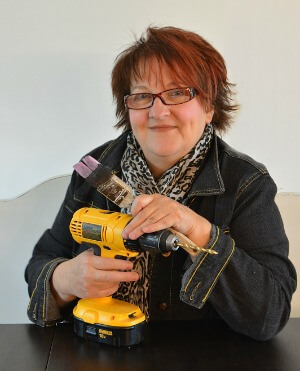 Using a needle with a large eye, attach the buttons using twine by crisscrossing over the button holes and through the burlap ribbon until all three buttons are sewed in place. Thread the needle with twine once again and loop it through the back of the burlap bow and through a ring on the wreath form and tie in place. Repeat this step 2-3 times around the back of the bow to secure in place. 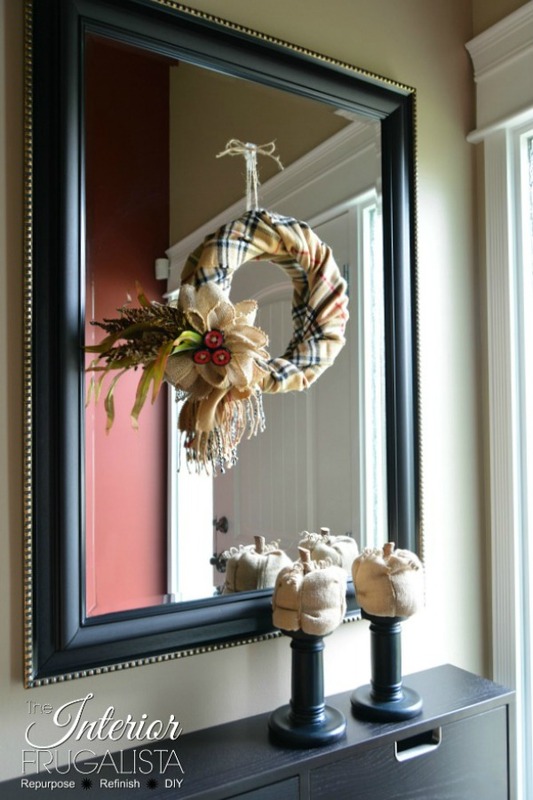 What is nice about this wreath is that if you ever wanted to use the scarf again, you simply cut the twine and unravel the scarf from the wreath form! 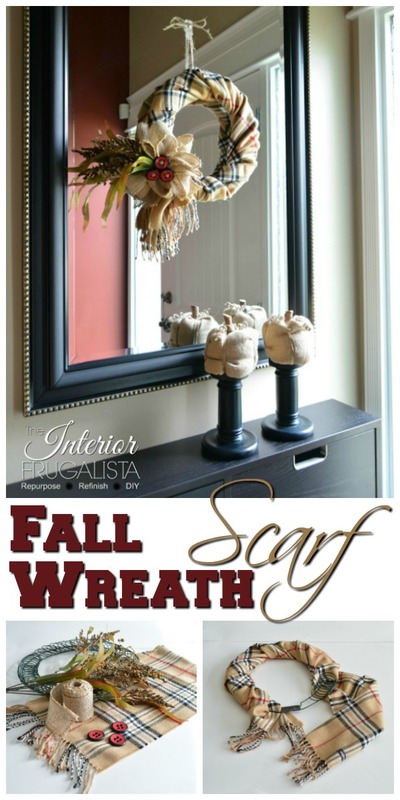 This is such an Easy Fall Scarf Wreath that takes less than 15 minutes to make. Last year for the Fall Ideas tour I also made a wreath. You can catch it here in my post, An Easy Peasy DIY Fall Wreath. When my daughter was visiting, I told her she could choose any of my Fall Wreaths to take home for her front door. She picked this one! I can't wait to see the other Fall Wreaths made by my talented friends participating in the Fall Ideas Tour today.